Compact, dwarf evergreen with small, elliptic or oblong, dark green leaves, scaly red-brown underneath. Small trusses of funnel-shaped, deep violet or blue-purple flowers often with white throats, in mid and late spring. Moist, well drained humus rich acid soil. Prefers full sun. 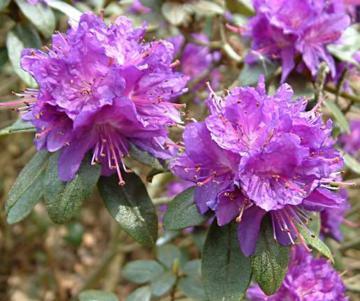 Introduced from southwest China by George Forrest in 1917.